Perhaps you’re too young to remember when Jeep produced reliable, off-road capable pickup trucks. However, from 1947 to 1992, the company had a varied segment that never quite resonated with consumers, especially with stiff competition from more established pickup manufacturers. That being said, Jeep plans to cut into a heavily contested pickup market with the Jeep Wrangler Pickup. While its success remains to be seen, it’s definitely an interesting and innovative move on the part of parent company Fiat. Here’s everything you need to know about the exciting 2017 Jeep Wrangler Pickup. As early as 2005, Jeep hinted at making a new pickup to cut into other market segments and target a new consumer base. The last concept was the Gladiator, which had remarkable looks that would definitely entice fans of the brand, as well as those looking to buy a Jeep that was a bit different from the ones already out. 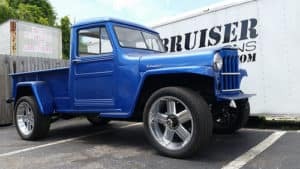 However, this model never made it to production, and critics and Jeep enthusiasts had to wait another 11 years before word of a new Jeep pickup came out. In January, Jeep CEO Mike Manley finally confirmed that the Wrangler Pickup will hit markets sometime next year, and you could hear the gasps and yells for miles around. For decades, Jeep manufactured their vehicles only on American soil, but due to global demand and cheaper labor prices overseas, they expanded their operations to three additional continents. If you’re a firm believe of the “Buy American” mantra, you have no reason to fear. Jeep plans to produce the Wrangler Pickup at their plant in Toledo, Ohio, which also currently builds the Cherokee and the standard Wrangler. It’s not yet known if the Cherokee’s assembly will continue in Toledo or if it will move elsewhere, but the Wrangler pickup will definitely have its roots in the Buckeye State. The 2017 model year of the normal Wrangler is currently shrouded in mystery, but Jeep confirms that the brand will undergo a complete redesign, which is its first since 2007. Because it’s technically a Wrangler the pickup will take its styling after the new Wrangler concept, but details are still scant. One thing that Jeep does promise is that the vehicle will have lightweight aluminum construction, which will vastly increase fuel economy. There’s also speculation that the Wrangler Pickup will come in both gasoline and diesel options, but once again, this hasn’t been confirmed. If the vehicle does come with a diesel and the aluminum frame, expect up to 30 miles per gallon, which will make it more efficient than many of its competitors. If you’ve never seen an old Jeep pickup, they’re boxy specimens, but with an aura of elegance surrounding them. That’s why Jeep plans to recreate this vision, but with modern updates. Under the hood, it will likely have Chrysler’s 3.8-liter, Pentastar V6 engine, which will boast a premium package of power and efficiency. Before you hop on the phone to your local dealer demanding to test drive the Wrangler Pickup, remember that there’s no set release date. So, try to relax and stay calm. It’ll be here before you know it.